Christmas is almost here and I haven't been posting my Christmas cards!!! What is wrong with me??? Well it's not too late so I'm starting today. 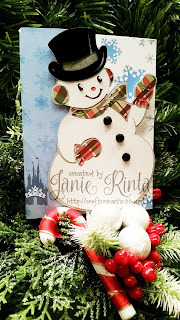 This card was made using my Cricut Explore, but any Cricut will work, and the Christmas Kitsch cartridge. 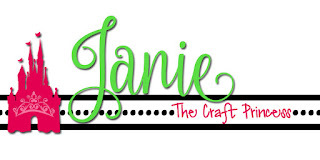 This is just adorable Janie, and great prop in your photography! Love your card! I think I have that cartridge and never used it! thanks for the inspiration! Such a fun card! I love all the special little details you added. Thanks so much for joining us this week at CRAFT Challenge! Happy New Year! Such a lovely card. card! Thanks for joining us at Holly Jolly Christmas Challenge. Do you have this on your youtube chanel?